Epoxy flooring is selfleveling to achieve excellent gloss, attractive, hygeinic and chemical resistant finish. It is smooth, monolithic and joint less surface. It is very easy to clean and to make it dust free. It is mostly used in Pharmaceuticals, Food processing plant, Hospitals, Electronic industries, Etc. An epoxy flooring is a smooth, monolithic flooring formed by pouring component mixture over the concrete floor. 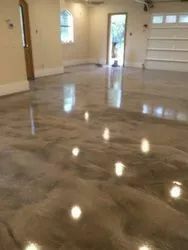 If the epoxy is self-smoothening, then it shall tend to spread across the floor, in a manner so as to minimize the undulation and bring about as level a floor as possible. 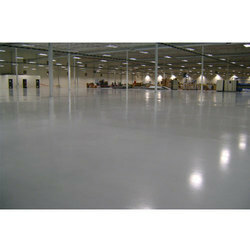 We are instrumental in offering reliable services related to Epoxy Flooring. Our team of proficient professionals uses different types of Epoxy and PU based coating material for rendering these services.